I know this self-congratulatory post is coming only a little over a month after my anniversary post, but yesterday Supergirl Comic Box Commentary passed 1,000,000 visits in just under the 3 years I have been following my stats. And I thought that was a nice little landmark to commemorate. So first off, the blog now has a new banner bar to welcome everyone. As I did before, I turned to my good friend Jeff Caporizzo to design the new look for the place. We both felt that my Craig Rousseau commission of Supergirl really captured her as a character. The tag line of 'critique, community, exclusive content' hopefully captures the spirit of this place. At least, that is what I hope this place has going for it. I decided to do some navel gazing and see which posts have mine have garnered the most hits over the years. Two posts' histories dwarf all others in terms of their viewing and I had to chuckle a bit. There are other posts I am much more proud of. And I think these popular ones have been seen not strictly for their content. It was a post done before the release of the Superman/Batman:Apocalypse movie, basically Supergirl's origin. In that post I hoped that there wouldn't be a 'naked Supergirl' in the movie. And, wouldn't you know it, 'naked Supergirl' is an oft-searched item on the internet leading people to that post. I can only assume that this is a popular post because the cover is Supergirl kissing Captain Marvel (and 'Supergirl kissing' is also a popular search term), includes a scan of Starfire and Donna Troy in bikinis, as well as a scan of Red Arrow with his arm ripped off. I also think this is pretty ironic. I wouldn't think any of those scans represent my purpose here. Anyways, I will continue my mini-celebration tomorrow by reviewing Supergirl #1,000,000. Thanks again Jeff! The new banner looks snazzy! The latest (and penultimate?) 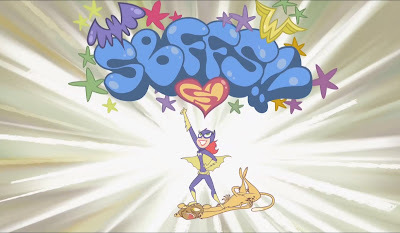 SBFF DC Nation short was shown this last weekend. And as with all of these shorts, this one was spectacular. After 3 episodes focusing on each of the team members and getting a feeling of their personalities, this one focused on their interactions with each other. As with most things Lauren Faust, there was definitely a major cute factor. But much like her My Little Pony:Friendship is Magic cartoon, there is more under the surface, even in this shortest of shorts. The episode starts out with a riff on the 'Superman saving a kitten from a tree' trope. Instead, here it is Supergirl uprooting a tree and shaking the Cheetah from it's limbs. Fantastic. While skirmishing with the villain, Batgirl declares that it is time for the three of them to become 'officially official' with an official team name! As with most of these shorts, Faust punctuates a big moment with a dramatic wild background (think Donna's star background in the first short). But this one is so befitting of the fangirl Batgirl we have met here. The balloon letters, the heart shaped S-shield, the stars and sparkles. And she seems so proud of her idea. But the other members aren't so sure. Wonder Girl wonders what the 'Sa-buffs' are. Supergirl thinks the name is stupid and she doesn't want the friends to be called that. She is Supergirl after all, so her tantrum tosses the other heroes aside potentially hurting them. I have to say, I wasn't sure if I would like Supergirl has the hot-head of the group but it has worked. Here, after seeing she might have hurt her best friends, she is completely remorseful and apologizes for not realizing her own strength and for losing her temper.. We have seen the 'punch first, ask questions later' Supergirl in a number of places including in Gates' work and the DCnU. With the apology accepted, they clasp hands 'all for one and one for all' style. 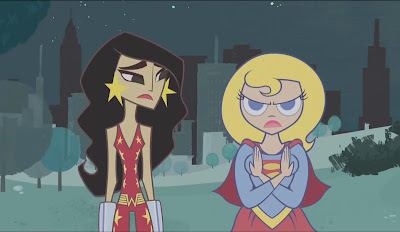 Supergirl realizes that maybe they are Best Friends Forever ... aaannnddd ... Super. This whole series has worked. Batgirl as ultra-caffeinated hero having a blast doing her job. Supergirl as mischievous young girl with a temper. 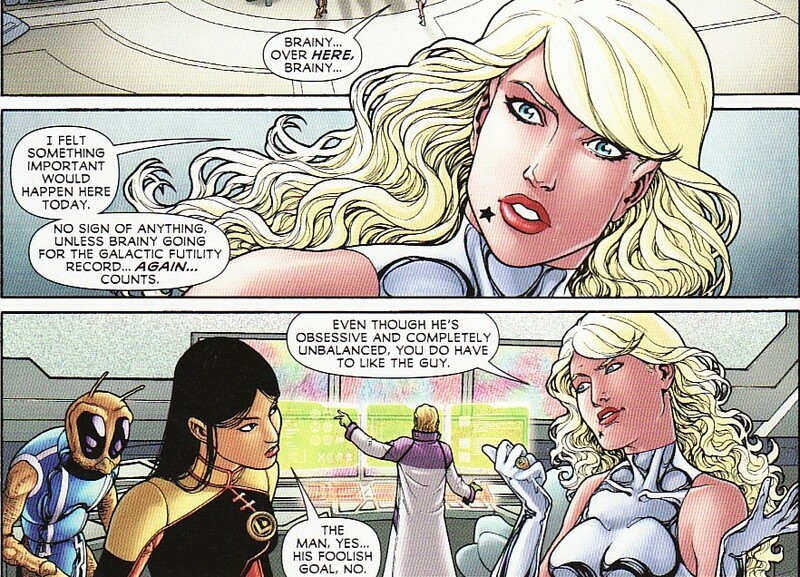 And Wonder Girl as mature mentor who is softened by her friends. There simply needs to be more of these shorts. DO IT DC ENTERTAINMENT!! This is the Supergirl sketch I’ve drawn at the workshop we conducted with Yildiray Cinar at the University we graduated from. 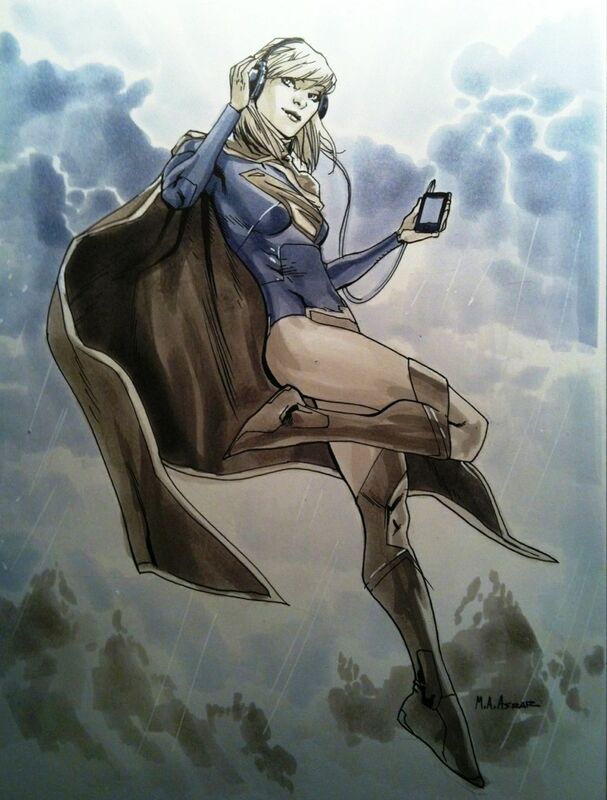 The thing that I liked about this picture was that it showed a relaxed Supergirl, listening to some tunes, and chilling out among the clouds. I love the little smile on her face. And she's wearing headphones, becoming more assimilated to Earth's culture. I wouldn't seeing something like this in the comic! On top of that, I just love the nuanced feel you get from Asrar's marker work. So ... what band do you think she is listening to? There is something about the serene look on her face that makes me think she is listening to some smooth jazz, like Dave Brubeck. If you are reading this Mr. Asrar, what music did you imagine her listening to? I like the face studies on the top pic showing a stern, coy, and happy Superman. There is a sort of retro-feel to these pics and Supes' body type. It sort of reminds me of Wayne Boring a bit. And is there anything better than the iconic 'ripping the shirt off' Superman pose. I like the Supergirl design a lot. It is a mix of my favorite Matrix-style costume with the red skirt and full shirt. But we also get some DCnU flourishes of the high cape and funky boots. Add to that a 'Gwen Stacy' headband, and that design is a winner. I would still love to see if there were other designs that didn't pass muster for Supergirl. Did they try the DCnU one piece? 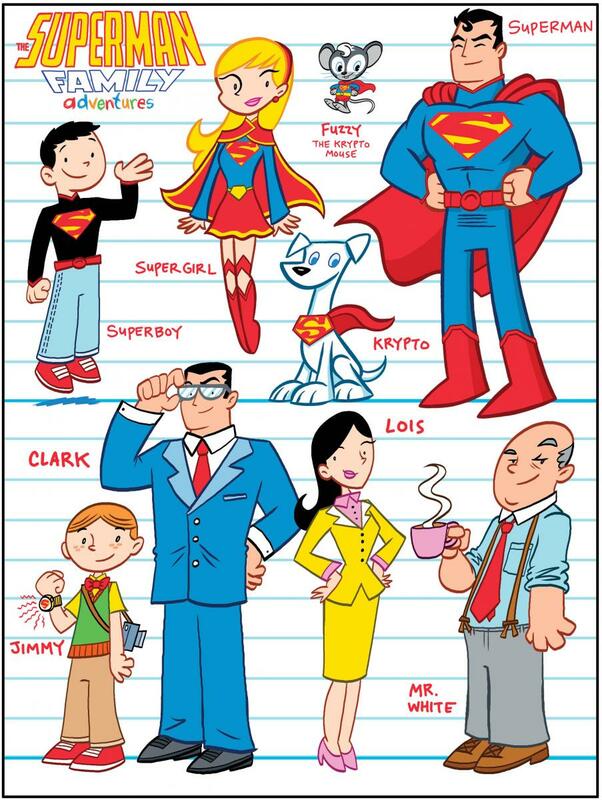 I also like how young they have Supergirl and Superboy look. Con looks like he's 12. Kara looks like she's about 15. Even Jimmy looks more like the copyboy he was initially. This is a kid's comic ... it should have kids in it. We also got to see some of the villains that are upcoming. I like Lex in the evil green lab coat. Brainiac looks more like the Brainiac from Geoff Johns and Gary Frank's pre-New Krypton story than either Silver Age or DCnU. And I love the quirky craziness of Mxy too. And lastly we round out the cast. Poor Chris. He is stuck as the miffed Lor-Zod here. And then there are Jimmy's cub reporter friends. 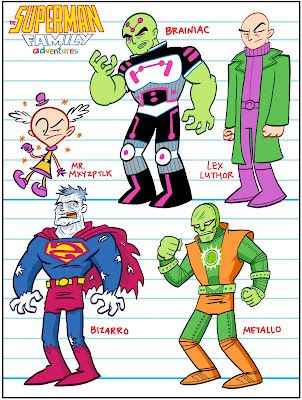 And no Superman Family book would be complete without Streaky! Aw yeah! I like how Superman is describe as striving to be a role model to the super-family. I also like that Supergirl and Superboy are bound to get into mischief. Sounds like fun. We are only a couple of days away from the book's release. I can't wait! 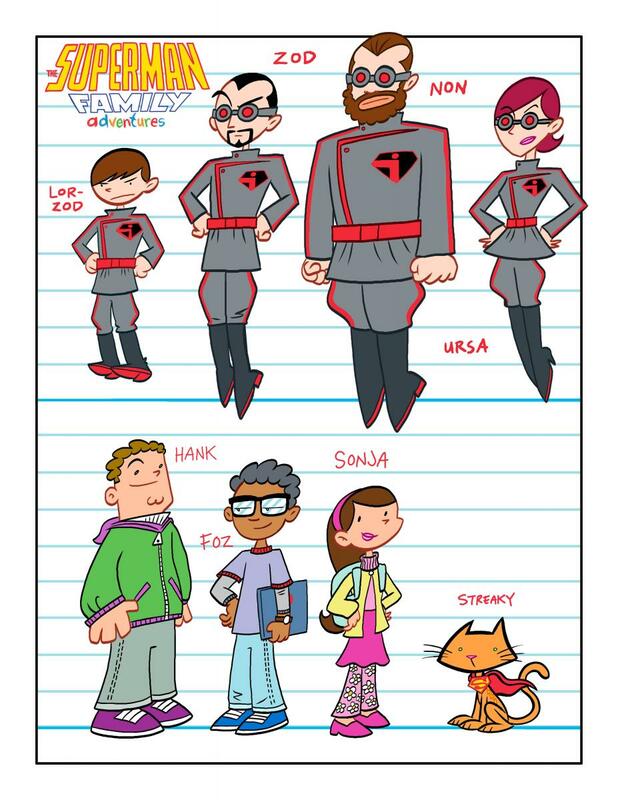 It's Saturday morning which means time for DC Nation cartoons! And best of all, this week there will be another Super Best Friends Forever Cartoon! While Young Justice has been very good (although I am liking Invasion less than last season's arc) and Green Lantern has been decent, it is Super Best Friends Forever that has been the big win for me. Heck, most of the shorts have been great fun. And today we have the next installment! 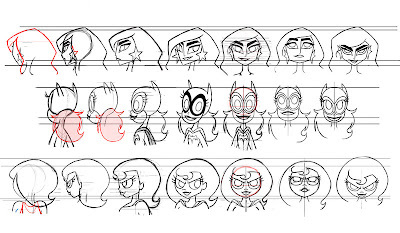 As I always say, process pieces or behind the scenes character studies fascinate me, giving me a look behind the curtain of the creative process. 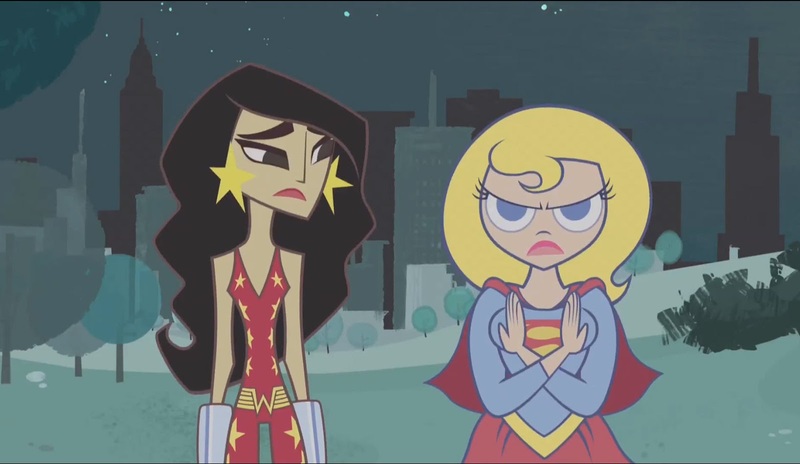 Supergirl looks so deviously mischievous here! There's only two more to go, so be sure to catch it! I don't know if I can tell you how sad I will be if there are only two more of these shorts. Two more?! We need many more of these! I hope DC is able to get a sense of how popular these are, how fantastic they are, and how much this is a great gateway vehicle bringing in the My Little Pony fans and having them fall in love with these characters and comic books. Do you hear me DC!! Don't deny me my SBFF!! Superman #9 came out this week and was a dense issue which started a couple of new plot threads and moved a couple more forward. One thing that I will say about this issue, it made me feel like there was a long term direction for this book. With several storylines brewing, all of which have their interesting points, it felt like I could settle into this title a bit. And then I remembered the rumors that a new writer, Scott Lobdell, is going to be on coming on board in a couple of months. Writers Dan Jurgens and Keith Giffen are at their best here. 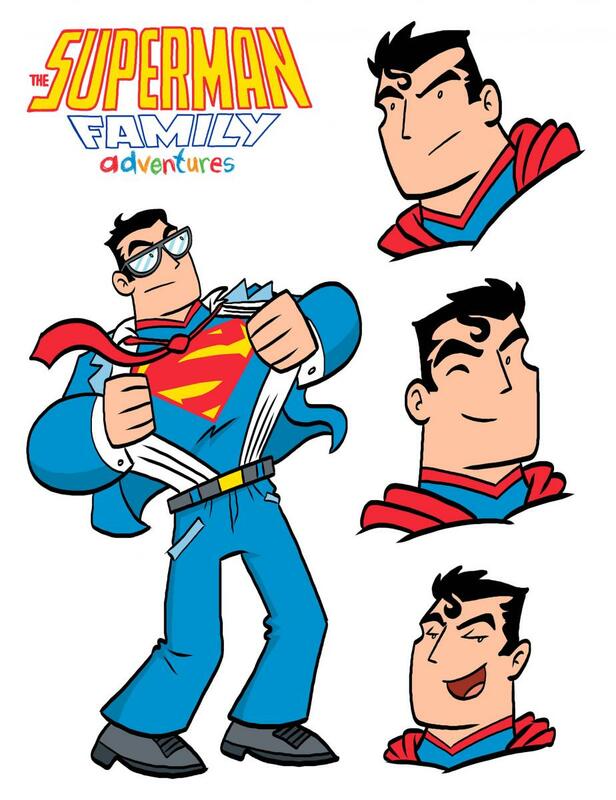 We have a couple of plots for Superman as well as the supporting cast. And we have solid characterization for everyone as well, getting a sense of how tough and ethical Lois is, how young and impetuous Jimmy is, and how put upon Clark feels. Dan Jurgens and Jesus Merino provide the art here and, much like last month, it has a bit of a rough and rushed feel in some places. And unfortunately that distracts a bit. 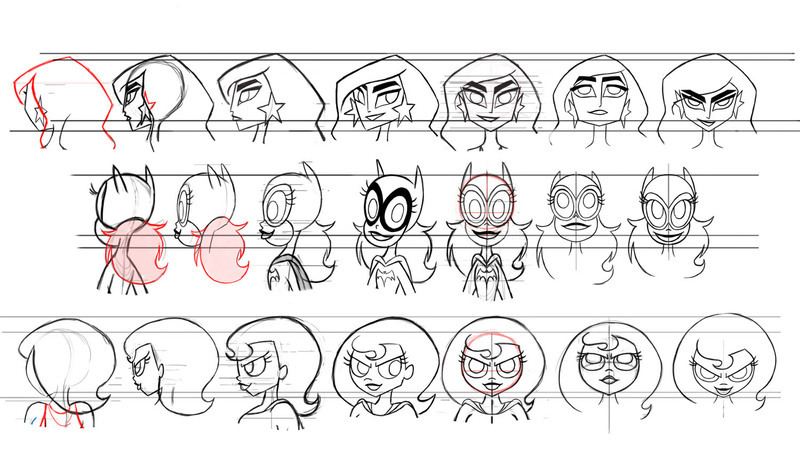 The layouts and character positioning all work. If only the finished piece matched. One thing that I did notice is that this cover is different than the original one solicited back in February. 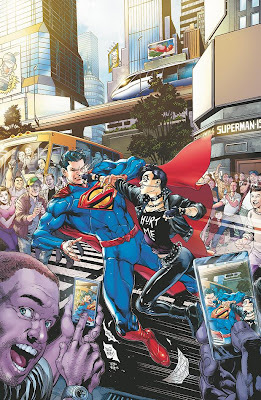 I wonder if DC realized that having Superman fighting with a woman with a 'Hurt Me' t-shirt isn't a very good image. It's too bad that the context of the image is wrong because the composition of the fight on a street while people click away on their phone cameras is solid and much more visually interesting than the new cover of Superman carrying a submarine. 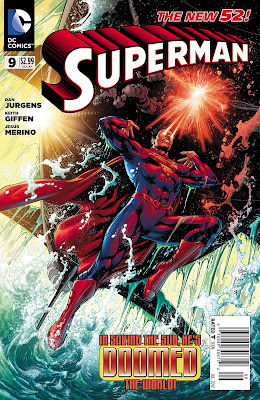 The book opens with Superman rescuing a Russian submarine. The sub is stuck against an underwater rock outcropping, its hull breached, its soldiers in danger. But there is more to this than meets the eye. Given the size of the hole, Superman surmises the sub must have been traveling at extremely high speeds. And the crew are worried that Superman will discover what it is they retrieved. So ... any guesses? It is a decent scene as we see Superman use his powers in variety of ways - low level heat vision to soften the hull metal, high intensity vision to arc-weld the hull closed, and good old fashioned punching to free the sub from the reef. What didn't sit well is the Russian Captain reference the Lone Ranger. In this day and age, who references the Lone Ranger any more? Meanwhile, back in Metropolis a publicity-hungry blogger (aren't we all) named Victor Barnes is pitching a story to Lois. He is convinced that Superman has a secret identity and he has proof of who it is. Lois doesn't buy it, wondering why Superman would have time to be anything else but Superman. When he is unable to produce the proof, Lois shows him the door. It reminds me of the earliest Byrne stories where no one thinks that Superman has a secret identity. 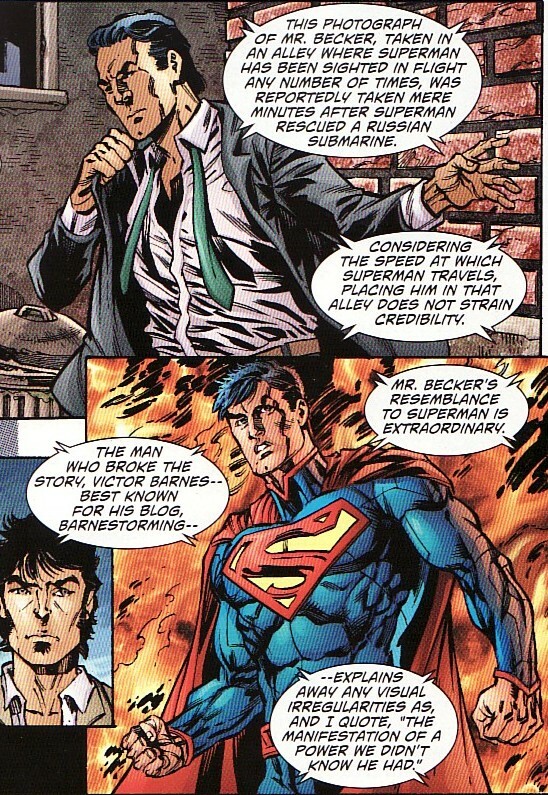 Even when a computer told Luthor that Clark Kent was Superman, Luthor refused to believe it saying someone like Superman would be using his powers all the time. In this new DCnU, Jimmy thinks that Superman lives on a tropical island surrounded by models. But it is good to see Lois stick to her journalistic convictions, refusing to go with a titillating and unproven story which, while good for ratings, didn't pass the sniff test. 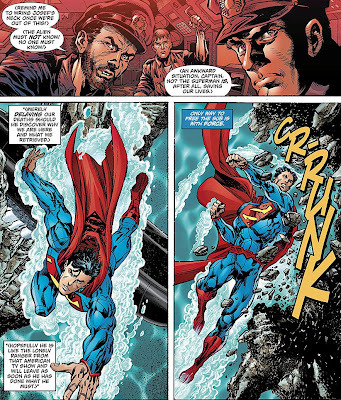 When he tries to help the Russian sailors more, the sub captain asks Superman to move along, making Superman even more suspicious. A lead lined sub traveling at high speeds and shooing away the hero who saved them. Something doesn't sit right. 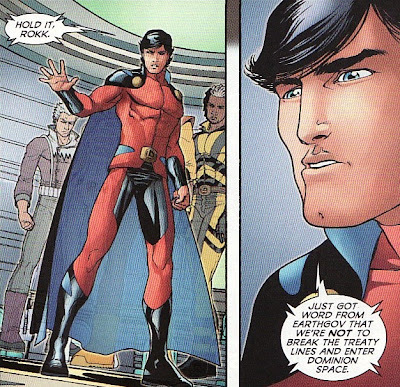 One thing that made me pause was Superman thinking 'not too paranoid' as he mulled over the curious matter of this sub. Do I want a paranoid Superman? I don't think he is paranoid; he knows the sub is hiding something. But I don't want a public that doesn't trust Superman and a Superman that doesn't trust anyone. That doesn't sound like a Superman book. Back in Metropolis, a new super-villain raids a bank vault. It is clear this young woman has issues with her father. And she has a curious set of powers. She apparently has super-strength, smashing open safes. So she can touch things. But nothing seems to be able to touch her. When she is fired on, the bullet passes through her. She is right to call this Metropolis policeman trigger happy. I mean, she might have grabbed some jewels from a safety deposit box (a pendant she claims is hers) but she is unarmed and not threatening anyone. To fire on her seems premature. Back at the planet, Clark has some explaining to do. Not about his whereabouts while fishing the Russian sub free. Nope, he has to explain to Lois why he forgot to pick up Lucy. Look at that second panel. Brrr .. talk about the cold shoulder. One thing that struck me here was that there seemed to be a feeling of repressed romance from Lois here. She is upset that he forgot about Lucy (which to be honest sounds like something you would ask a significant other to do, not a friend). She worries that Lucy will maintain this first impression of Clark being a screw-up (why is Lois so concerned about what her sister thinks of Clark). And to make things up she invites Clark to buy her and Lucy an expensive dinner. It sounds like she is trying to show off Clark to her sister. It felt like she had stronger feelings than just friendship here. And that, of course, flies in the face of the recent Idelson interview where he said a Clark/Lois romance would NEVER happen while he was editor. I did chuckle that the restaurant is Carlini's, a nice homage to long time Superman editor Mike Carlin (whose nickname was The Great Carlini). When news spreads of the young thief Anguish reaches Clark, he decides to engage. Again, her powers are interesting. Superman can't touch her, either with fists or heat vision. But she can touch him and lays him out with a series of punches which floor him. How can she pack such a punch? I have no idea about how this power can be explained but I am sure her father has something to do with it. In the meantime, Barnes has dropped down a journalistic rung and heads to Morgan Edge to pitch his story. And Edge decides to run it. Barnes believes a video game designer named Spence Becker is Superman. Barnes has pics of Barnes getting dressed or undressed in a Metropolis alley where Superman has been seen. Why the heck is Barnes in that alley in some degree of undress. That better be explained. More importantly, it is revealed Becker has a family. I am sure that his wife and daughter will be put in peril next week as vengeance-craving criminal decide to go hunting. And I bet that somehow Anguish's father issues somehow play off Becker's daughter's story. So, certainly a lot is happening in this issue. But as I said, these all add some depth to this book. I especially appreciated the time devoted to the Daily Planet staff, especially Lois. Am I the only one who felt there was some romantic sentiment bubbling under the surface? After the two-part Helspont story and now this world-building issue, I am confident that a Giffen/Jurgens led book would be fantastic. We'll have to see if the Lobdell rumor comes to pass. 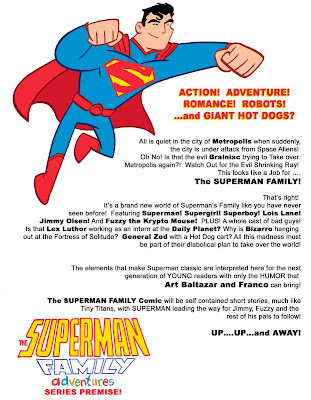 Yesterday I started a review of a 'Supergirl on trial' story which appeared in Superman Family comic. Today I'll finish the review by looking at 'Memories of Menace! ', the Supergirl entry in Superman Family #189. As I said yesterday, Jack C. Harris actually built his stories on a foundation of some Supergirl history, something which I think wasn't done too often in this time period. 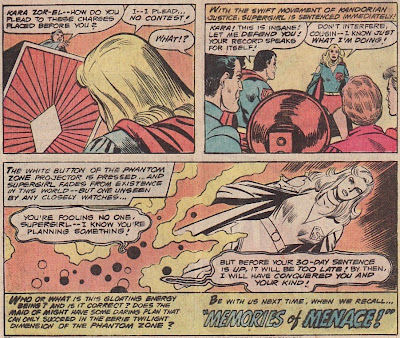 In the post-Action back-up feature stories, most authors seemed to ignore Supergirl's mythos. As a result there never seemed to be a strong supporting cast, a rogue's gallery, or a sense of journey. At least Harris looked back at what was Supergirl's arch-nemesis in the Action Comics days and set up a showdown. 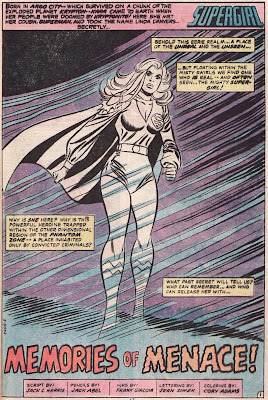 Jack Abel's art seems pretty standard even for the time period and doesn't let Supergirl shine too much. The story starts right where last issue left off. 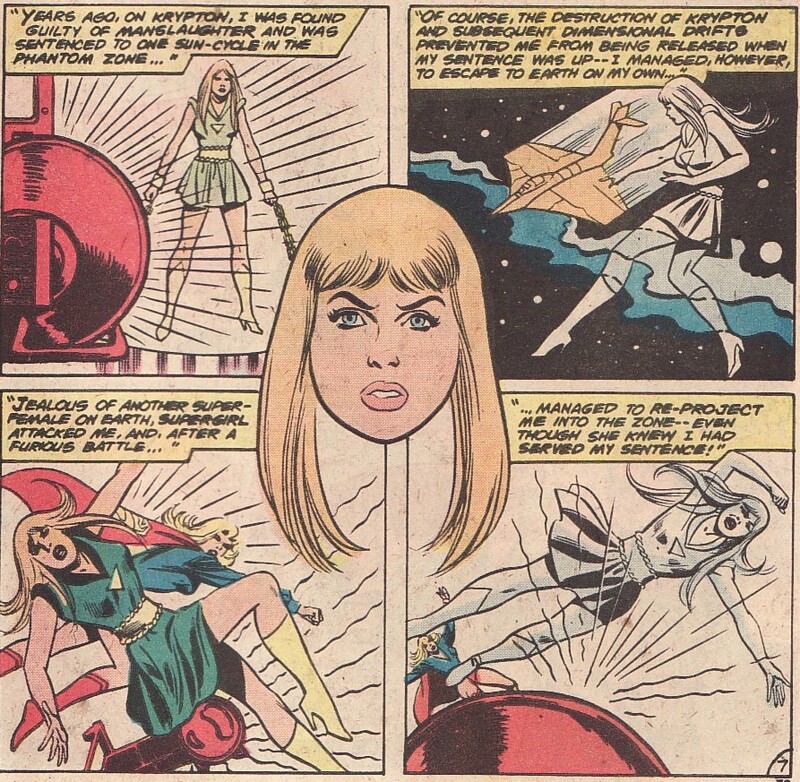 Supergirl has been sent to the Phantom Zone after pleading no contest to a charge she falsely imprisoned a Kryptonian criminal named Shyla, sending her back to the Zone despite Shyla having finished her sentence long ago. 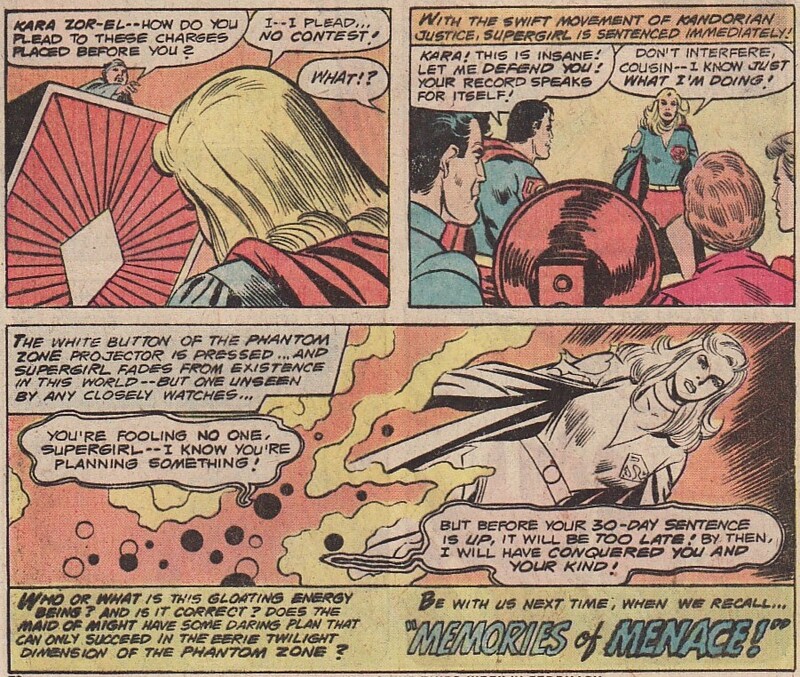 Still, Supergirl seemed to have a plan to use the Zone to exonerate herself from damning mento-tape testimony showing her conspiring with Lex Luthor years earlier. Already you can get a sense for the art here. There is just something off with how Supergirl's costume looks like. The shirt and shorts seem wrong. And Superman, acting as her defense lawyer, does his best to buy Supergirl some time. 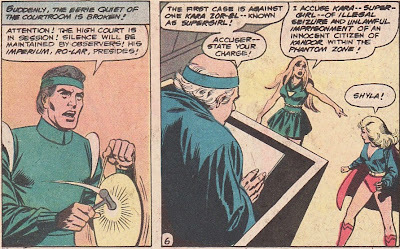 Despite her having already been sentenced and her punishment meted out, he asks that the 'official closing' of the case be delayed a mere 12 wolus (the Kryptonian equivalent of 20 minutes). And Superman's request is met with 'interest' so it is granted. I am still shaking my heads about this. Superman and Supergirl have saved Kandor countless times and Supergirl's heroic history speaks for itself. This just reeked of 'rush to judgment'. A twenty minute recess after you have banished her to the zone after a one day trial! Crazy! Now I don't know if Supergirl asked for only 20 minutes or if Superman plucked that number out of the air. Either way, it doesn't seem prudent. 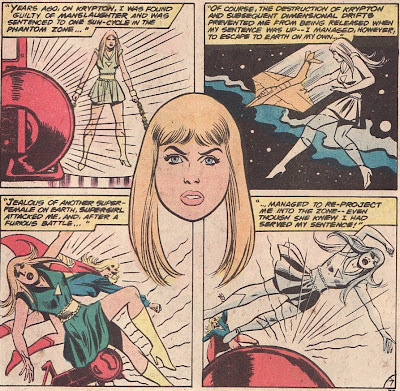 Whatever Supergirl is looking for, it is in the Phantom Zone ... a limitless dimension of ether. How could she hope to find what she was looking for that quickly?? And it doesn't help that there are a bunch of crazed criminals with a fierce hatred of the El family in the Zone. 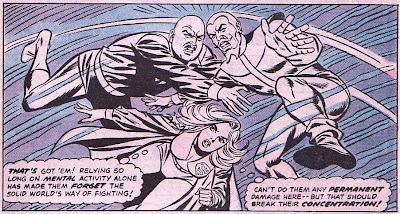 When they see Supergirl, they attack using the limited telepathic power they have in the Zone, drilling into her mind. I do like that in a time of crisis, she thinks of her family, perhaps a way of support to help her maintain her resolve and fight back. Kara decides that the best way to stymie a mental attack is to go physical. 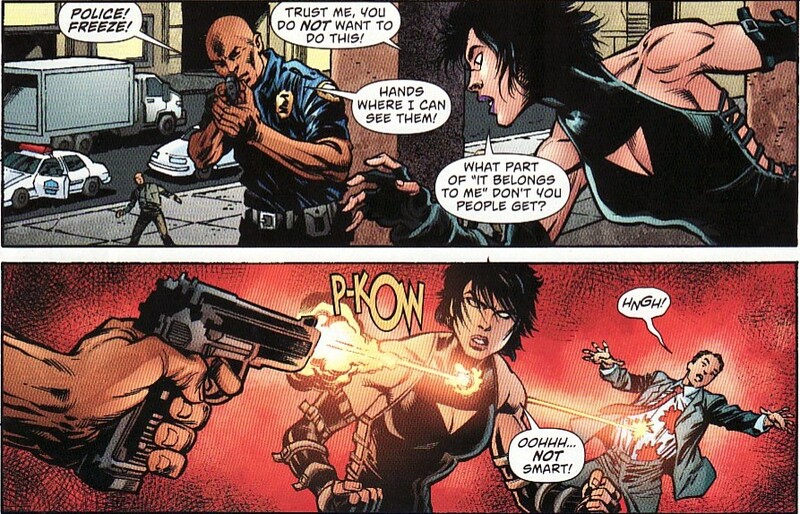 She brawls with the criminals and given their circumstances she is a simply the better fighter. I have to say, I was not aware that the phantoms could physically interact with each other in the Zone. I don't know that that has always been the case. 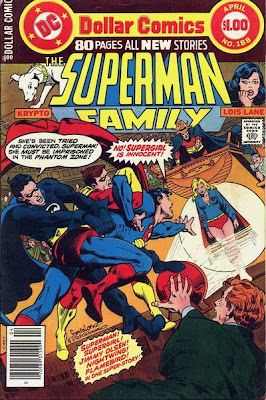 Unfortunately, the criminals do outnumber Kara and would seem to be re-organizing when Supergirl gets some unexpected help from another person in the Phantom Zone ... Mon-El! Supergirl knows Mon-El from their Legion days together. He, of course, is 1000 years away from being released. Luckily ... or maybe it was Supergirl's plan all along ... Mon-El was snooping on Supergirl's life during the alleged meetings with Luthor. And so he can provide some mento-tape testimony as well. This was the crucial evidence she was hoping for. I guess it was luck that he witnessed these things. He could have been anywhere in the Zone and watching anything (like maybe Daxam). Instead he was keeping track of Supergirl on Earth. There is no easy explanation about why he was stalking her ... watching her life ... but I suppose that is a story for another day. 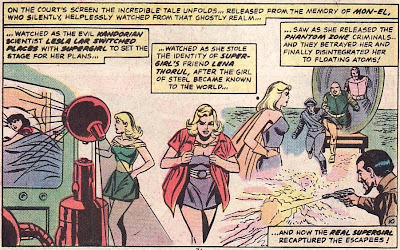 As the 20 minutes are about to elapse, Superman runs to the Phantom Zone Projector and turns it on. The Mon-El mento tape is tossed out for the court to peruse. And so the story of Supergirl nemesis Lesla Lar plays out for the court. How she looked exactly like Supergirl, how she brainwashed and switched places with Kara (explaining Kara's blackouts), and how she met with Luthor and released the Phantom Zone villains before dying at their treacherous hands. It was Lesla Lar, dressed as Supergirl, that Luthor met in that prior mento-tape testimony. Shyla seethes while the 'energy blob' mastermind, the disembodied mind who orchestrated this revenge scheme, continues to plan its next move. Spoiler alert ... 30 years late ... the blob is the psychic presence of Lesla Lar, her mind continuing to exist after her body was atomized. She wants revenge on Supergirl and she has been hammering away to get it. 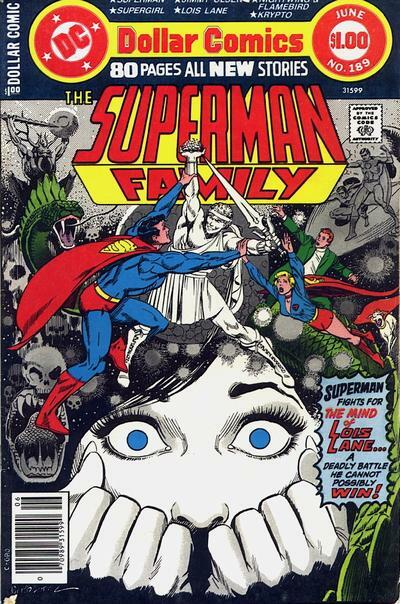 After several more villainous plans fail, Lesla Lar faces off against Supergirl psychically and face-to-face in Superman Family #206. Meanwhile, the Mon-El testimony clears Supergirl so her crime record is expunged and she is set free. Boy, justice is swift and reversal of fortunes are swifter in Kryptonian courts. This whole thing took less than a day! And so our hero is returned to freedom. It is so Supergirl to thank Superman for helping her even though he acknowledges that it was her plan that worked. And then one of the most catty moments I know in Supergirl history. Supergirl promises Shyla that if they cross paths again, Supergirl will rip out her hair! Meeee-owww. I had to laugh at this lapse in characterization. It would be one thing for Supergirl to warn Shyla that they better not see each other again ... but threatening hair pulling? That just sounds so petty. So from a Supergirl collection point of view, I would again say this is of low importance. I have to say that these two issues really gave me some insight into the Kryptonian criminal justice system. Things sure happen fast there! As I said before though, I think Harris slowly building up the Lesla Lar storyline was a good thing especially given Supergirl continuity (or lack thereof) for the time. As for me, I guess we'll need to see if I end up being chosen for jury duty. I recently got a summons for Federal Jury duty which, while my civic duty, would be somewhat cumbersome on my crazy schedule. So how was I going to deal with this sudden new massive item on my 'To Do' list? Why, by thumbing through the long boxes to find some Supergirl story involving juries and courts, etc. 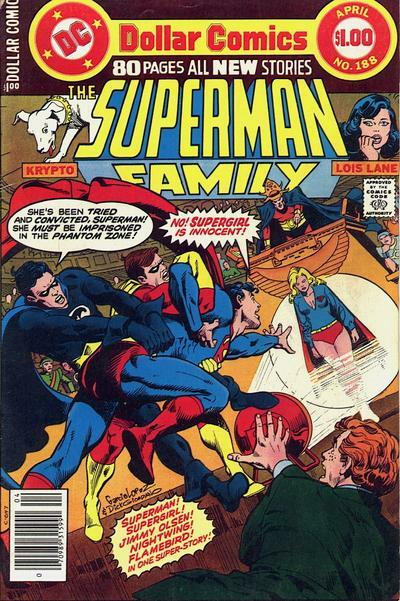 And so, behold Superman Family #188, in which Supergirl is put on trial! As I have said before, these Superman Family Supergirl stories can be pretty rough both in concept and in art. 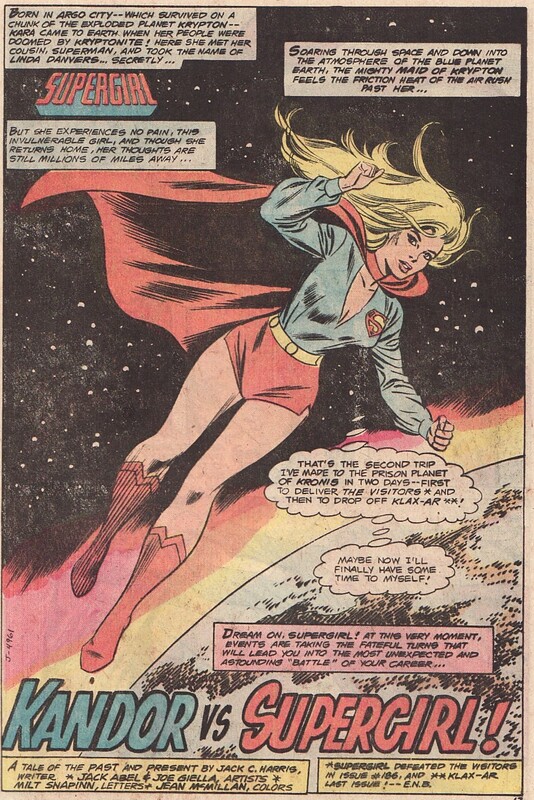 But one of the things that I will say about this particular mini-run in these issues is that writer Jack C. Harris actually had a working knowledge of Supergirl history and tried to bring in some concepts and characters from her early Action Comics stories into this book a couple of decades later. Remember, this was back in the day ... before the internet, before Showcase trades, before many trades at all. So this is an interesting story and arc for that reason alone. But, as I said, the actualization and the art can be rough and that is true for this as well. Harris does a good job moving the story along in the small number of pages that he has to tell the story but you have to make a couple of leaps of faith to buy the turn of events. Moreover, the art on this issue is Jack Abel and his stuff is pretty crude. There are no great artists on Supergirl during her times here - Abel, Mortimer, Heck, etc. 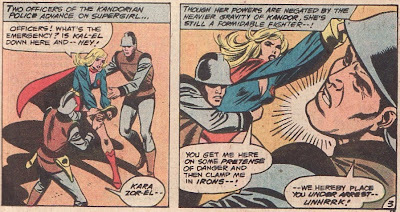 And so, here is 'Kandor vs. Supergirl'. Harris had Supergirl's adventures span from villains attacking New Athens Florida to intergalactic threats requiring spme super-hero assistance. 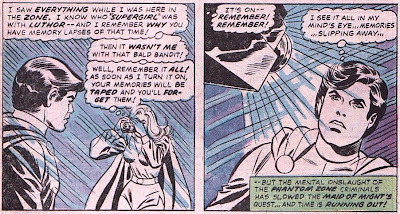 Throughout this particular run, there has been a number of odd events plaguing Supergirl, all orchestrated by an odd amorphous cloud which seems to have a vendetta against the Girl of Steel. After a quick trip out to a prison planet, Supergirl returns home looking for a little rest and relaxation. But right from the start, you just get the sense that the art here is somewhat crude. But, as is usually the case for Supergirl, there is little time for rest. 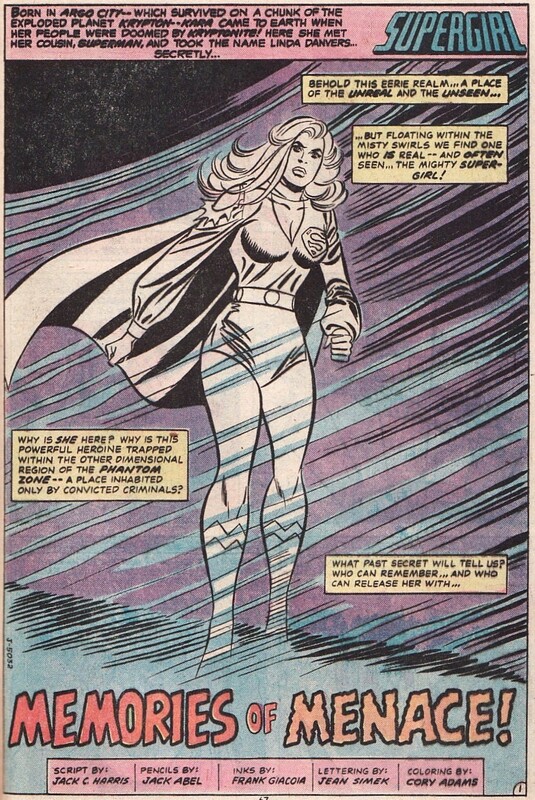 As she approaches the Fortress, hoping to unwind, she hears Kandor calling her. She is needed immediately for an emergency. 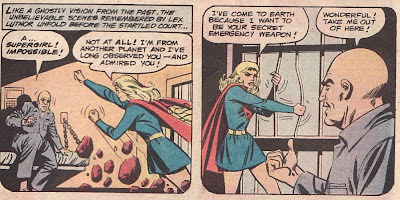 And, being in such a rush to head to Kandor to help, Supergirl decided the best and most expedient way to enter the Fortress is to rip the door off its hinges. Really? I just think that the time to turn the key would be the same as it took to destroy the door. 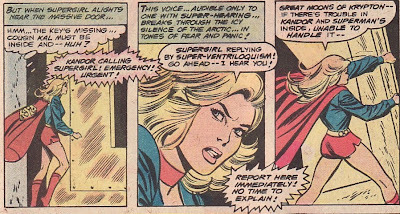 Moreover, I think it is crazy that Kandor would call her like this. 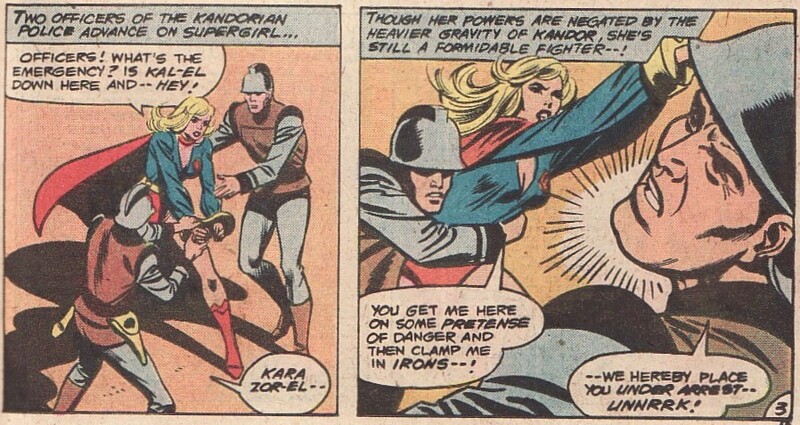 Sure ... she is Supergirl but she doesn't have super-powers in Kandor. I guess she is held in such high regard by the Kandorians that they might actually call her to help out in a crisis, with or without powers. 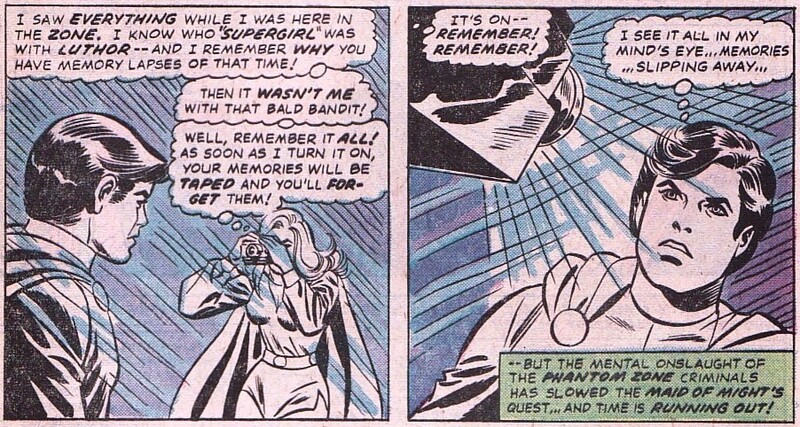 Turns out that whole cry for help was a ruse to bring Supergirl into Kandor ... to arrest her! No subpoena. 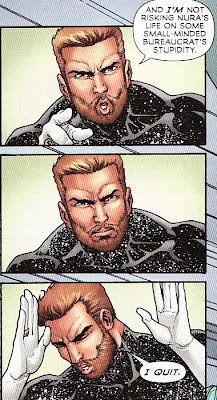 No 'please come to Kandor to discuss a matter concerning you'. No 'Supergirl we can't believe these charges that are being brought against you. Come to Kandor to talk to the authorities'. Nothing like that. Instead it's a sort of entrapment. So maybe they don't hold her in high regard. This just didn't feel right. I think Supergirl would come willingly if they simply asked her. And, of course, Supergirl doesn't help her cause her. Slapped in old-fashioned irons, she decides the besy course of action is to attack the Kandorian police. I suppose it shows that she isn't a pushover, that she will defend herself. And she is listed as a 'formidable fighter'. She awakens in prison and Superman is there. He was notified of Supergirl's arrest and came to help. This was somewhat interesting if only to see how Kryptonian courts operate which is, unfortunately, extremely close to American courts. I did like the gong to announce the judge. It turns out that she is accused of falsely imprisoning another Kryptonian named Shyla. Well, at least she gets to face her accuser. 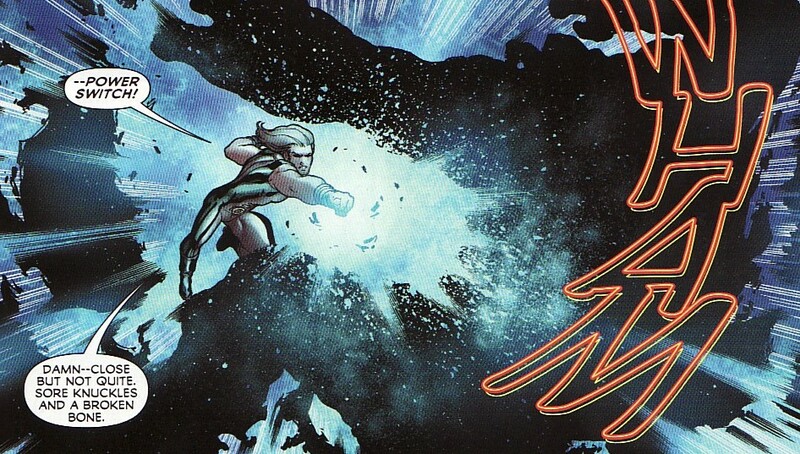 Earlier in the year, in Superman Family, Supergirl fought Shyla. 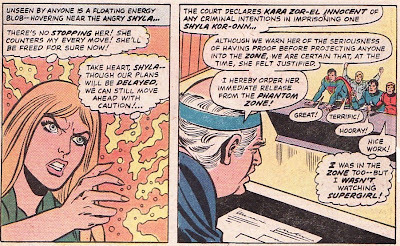 In something of a sad story, we learn that Shyla was scheduled to a year in the Phantom Zone but prior to being released, Krypton exploded. Unfortunately that has meant that she has stayed decades in the zone instead of that one year. Guided by that vengeful invisible energy cloud, Shyla found a rent in space which allowed her to escape the zone. 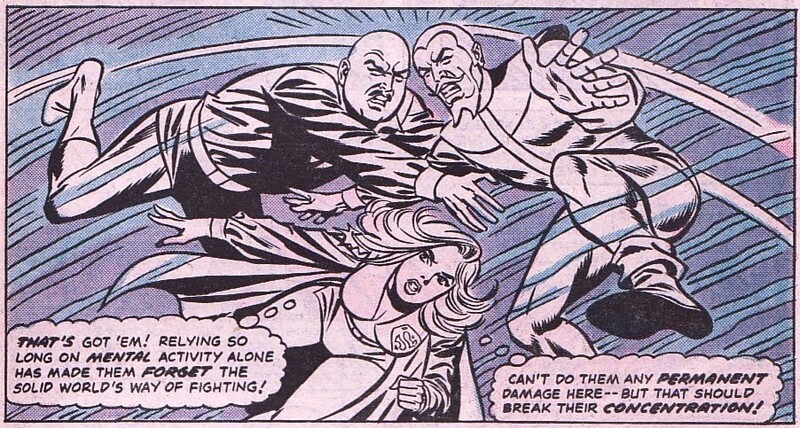 Unfortunately, she used her freedom to attack Supergirl and try to rob Kara of her super-powers. With little choice, Supergirl sent her back into the Zone despite knowing that Shyla had served her sentence. 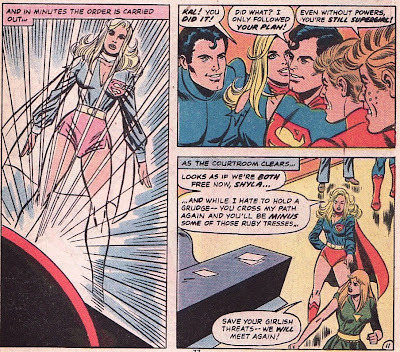 Thus, Supergirl stands accused of wrongful imprisonment. Well, there is a lot to dissect here. For one, why hasn't the court system on Kandor done a sort of review of the Zone criminals and release those who are due to be released? Aren't they really to blame? And is the extra days that Supergirl had Shyla in the Zone a drop in the bucket to the 20+ years that penal system left there to rot? 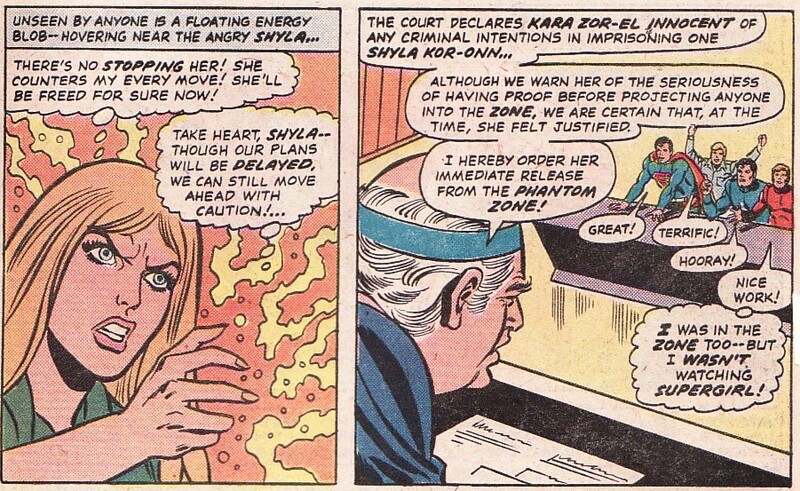 Moreover, the prosecutors insist that Supergirl imprisoned Shyla with 'criminal intent', not just for self-defense. And they have proof! There is surprise evidence ... a mento-tape! The mento-tape is a sort of mental recording of a person's memories. 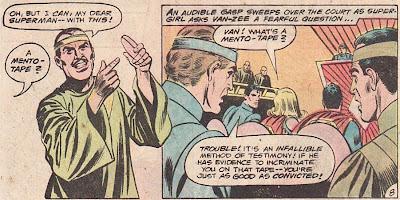 One cannot fake a mento-tape is considered infallible in the Kryptonian court of law. Ooohh .... surprise evidence ... this is like Law and Order. The good Law & Order, with Jerry Orbach and Jill Hennessy! Actually, this is somewhat concerning. Maybe the person doesn't remember everything quite right. Isn't there a subjective component to someone's recollections? Is that really infallible? 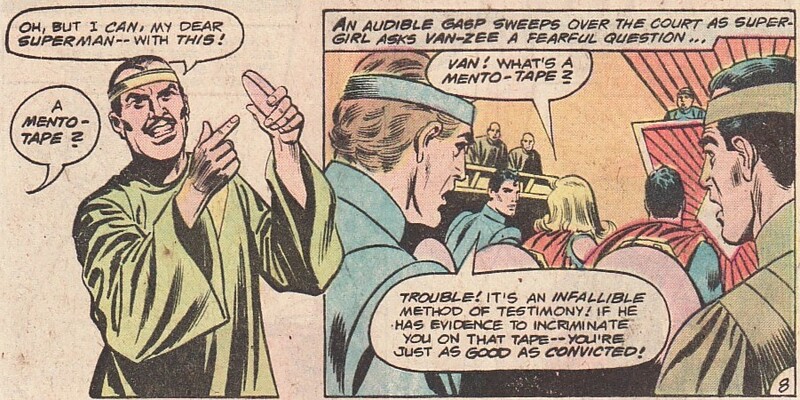 What's worse ... the mento-tape recording is from Lex Luthor! Yeah ... that's great ... an evil scientific genius with a grudge against the El family is the star witness for the prosecution. Nothing to worry about there! Lex does have some interesting memories though. He remembers Supergirl breaking Luthor out of jail, giving him super-powers, and asking him to be her mentor. This is back in time a bit. 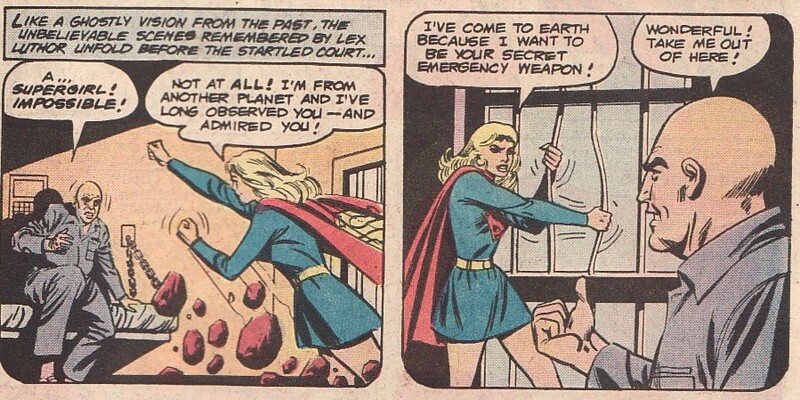 Supergirl is wearing the blue skirt uniform and makes reference to being a secret emergency weapon. Now long time Supergirl fans might remember this as actually having happened ... in a way. But the mento-tape doesn't lie. This did happen. While she might not have had criminal intent in throwing Shyla in the Zone, she can't be sure she was never a criminal. And so she pleads no contest, feeling she deserves to be imprisoned. 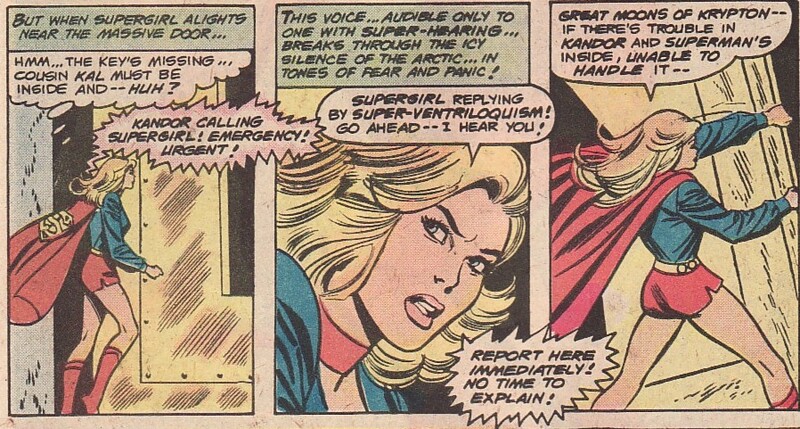 Despite Superman's plea to defend her, to let her spotless record speak for itself, Supergirl is determined. She is sentenced to 30 days in the Zone and she willingly goes. Hmmm ... she says she knows what she is doing, so maybe she has a plan and isn't just throwing in the towel. And in the last panel we see that energy cloud gloating that things are going as planned. Supergirl won't survive her sentence. So I have pointed out enough issues with the Kryptonian police force and judicial system to know that I would not want to be falsely accused of a crime there. Lured into an arrest, no 'out on personal recognizance' after years of being a hero, thrown in jail based on the recollections of a super-villains - scary. My guess is if I was falsely arrested that no matter what I would end up in the Zone, and probably for too long to boot. Still there is either something noble or sly about Supergirl pleading 'no contest'. Noble if she thinks she 'did the crime' so has to 'do the time'. Sly if it is all part of some wild plan to prove her innocence. 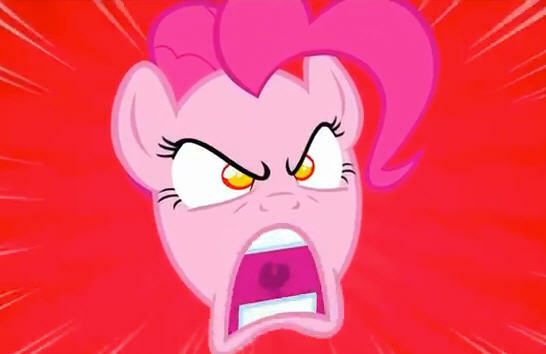 That said, I don't know if it is ever a good plan to be shot into the Phantom Zone. Abel's art is average at best with little distinguishing style. As for it's place in a Supergirl collection, I would put it in the low importance category. The final denouement of this story, with the reveal of what the cloud is, probably would be bumped up to moderate importance. I don't want to ruin a 30yr old story point ... at least not here. But I probably will when I review part 2 of this story. Superman Family Adventures is a comic that I have been eagerly anticipating since I heard about it. I have wanted an all-ages Superman book for a while, something to share with my kids to expose them to all the Superman mythos. They loved Tiny Titans and Batman:Brave and the Bold. They love Young Justice. And they really really loved Supergirl Cosmic Adventures, a book they still reread. But what is missing in that list is a true Superman book, something that has Supergirl and Superman and the Daily Planet crew, etc. And now I have that! It sounds like all sorts of Silver Age loveliness. It sounds like it will be a lot of fun. And while the pitch has HUMOR in capitals, my guess is this won't just be a book to get some yuks. 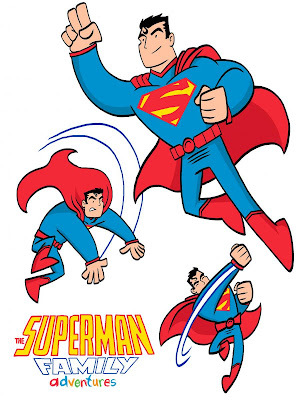 The preview pages reads like a standard Superman adventure with humor infused in it, not dominating. The Source will post behind the scenes looks at the book up to its release on May 30th. I can't wait to see the Supergirl design pics! 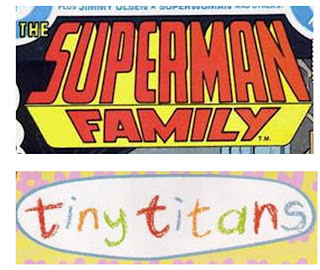 I love the title appearance on the pitch sheet mixing the old-school Superman Family logo with the crayon 'adventures' symbolically linking it to the sensibilities of the old Family book with the fun of Tiny Titans. 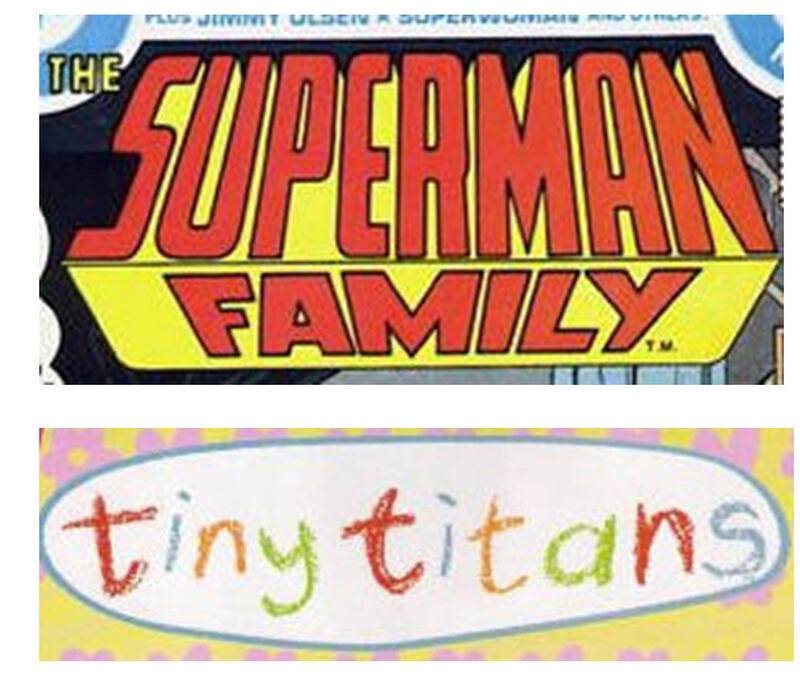 Anyways, I loved Tiny Titans as much as the supergirls at home, so this looks like must reading for the whole family. Can't wait! 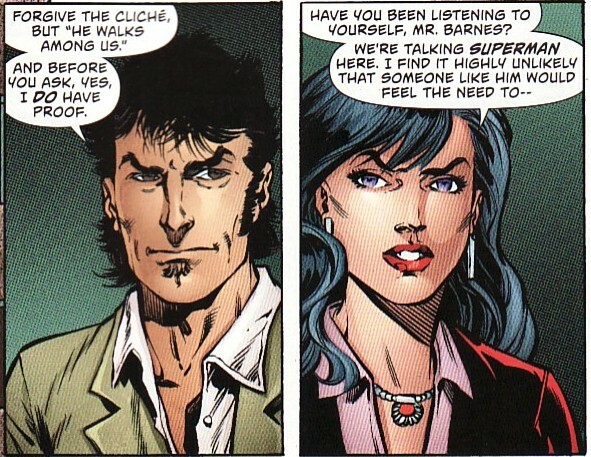 One of the most reported questions involved Idelson saying that Clark and Lois won't be a couple ever ... at least while he is editor. 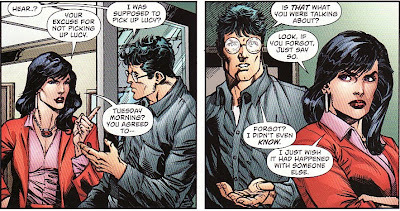 As big a fan of the Clark/Lois relationship as I was, I didn't think this was too incendiary. We are 9 months into the DCnU. 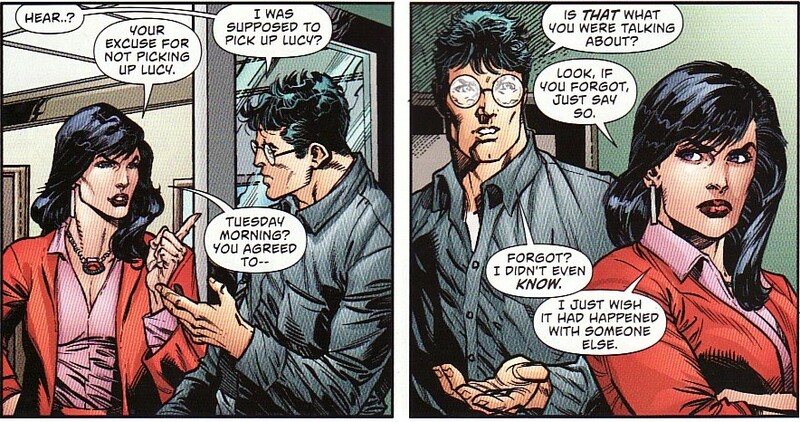 As much as I like Clark and Lois together, I don't feel a rush to get them there. And given the tenuous state of comic runs and themes, who knows if that statement is anything more than air. Here are the other questions that impact Supergirl, a couple that comment on things that interest me, and my comments. Matt: Nah, we're not that shallow, Pardeep. Superman has slowly been building up the solar charge in his cells from the moment he popped out of his rocket on Earth to the present. He's like a battery that's been charging up all this time. In the pages of ACTION, he isn't yet at the point of a full charge. 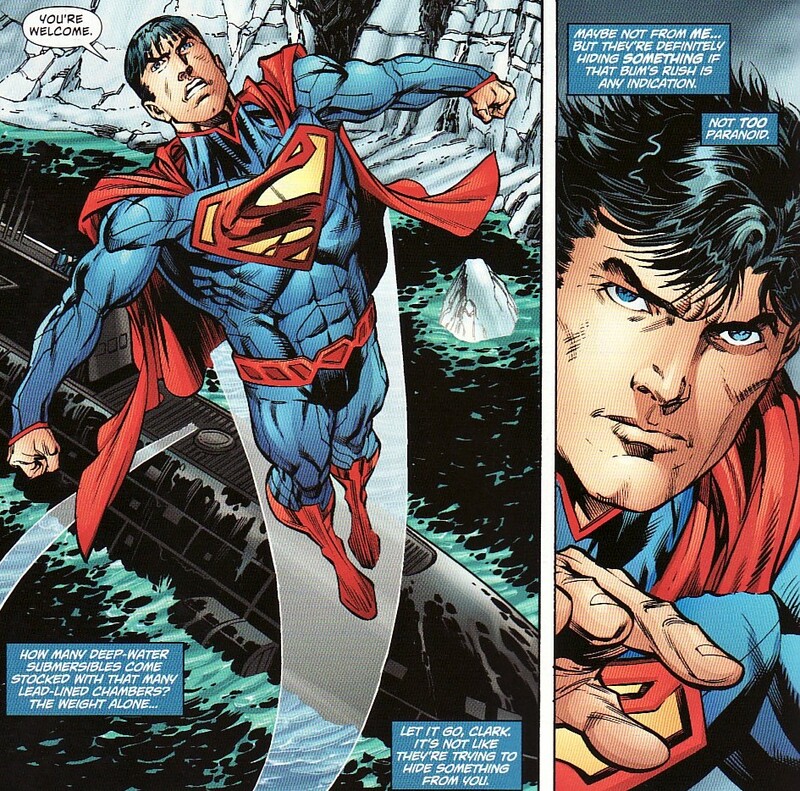 SUPERMAN proper is more representative of how powerful he'll be. So why was Supergirl at full strength when she popped out of her rocket, you ask? Guess you'll have to stick around through issue #12 of her title, when that answer will at last be made clear. The whole 'Supergirl is more powerful than Superman' theme was explored and poked and abandoned in the earliest issues of the Loeb Supergirl. And I didn't like the way that played out, especially given the characterization of Kara at that time. Idelson doesn't say she is more powerful than Superman so I don' t think that is what is going to be happening this time around. And the 'new abilities' are just different, not necessarily putting her over the top. Of course, the fear is still out there that her DNA was tinkered with, that she was part of the 'World Killer' science experiments. Perhaps the best thing about this answer is that we will learn more in Supergirl #12 (we'll touch on this again later). If we are learning why she emerges fully energized maybe we will learn more about the particulars of her being rocketed to Earth, the whos, wheres, and whens. I LOVE the reboot. But based on the amount of time you spend apologizing to a certain sector of fans here, I was wondering how do you gauge customer satisfaction? Is it purely on sales figures or are there other methods you use? Matt: Honestly, it mostly comes down to sales, John. My experience has been that people vote with their dollars, more than ever. With so many titles to choose from each month, both from DC and the other companies out there, I think we can reliably look at our month-to-month sales and gauge whether what we're doing is working or not. As far as determining what, specifically is not working, that's a little trickier. This question along with the next question is a little worrisome to me. I understand that comics are a business so sales has to determine things in the end. But I hope that sales aren't the only determination. I hope that if DC has confidence in the quality of a book that they will keep it around to build its audience. And if there is fan buzz from a smaller sales number, I hope they would let that grass roots movement have time to inspire new sales. As a female fan of Superman I find it very disheartening a certain section of this fandom are going around the internet and accusing DC creators like Rags Morales, Geoff Johns, Grant Morrison, James Robinson as woman hating. I for one love what you are doing with Superman and I don't agree nor appreciate the unfair bashing of hard working creators. How do you begin to deal with this kind of irrational hysteria that is in no way reflective of all female fans? Matt: That's an awesome question, fmoon, and I wish I had a (semi) monthly prize to give you! Honestly, the only way to deal with this sort of thing is to ignore it. The internet invites all sorts of horrible commentary, accusations and rumor mongering, and it's like that 'cause people don't have to sign their name to it or look you in the eye when saying it. It's kind of the coward's domain, in effect. And since none of us in this business can control what other people think, the best we can do is just keep doing our work, sticking to our principles and forging ahead. I used to read reviews of the books I work on, but so often the "critiques" were unconstructive and generally fell into the realm of things I can't repeat here, rather than a thoughtful analysis of what did or didn't work. Believe me, if I thought I could get useful feedback from the internet, I'd be all over that. That's not to say that every review site falls into this category, but you reach a point where it's just not worth sorting through the noise for useful nuggets of wisdom, you know? Truthfully, the best feedback I get from readers is via this column and when I go to conventions. Man, I don't want to touch the 'irrational hysteria' of 'female fans' part of that question with a ten foot pole. Unreal. That said, the rest of the answer is somewhat concerning, especially given my thoughts on the previous question. So Idelson doesn't read reviews of books? He doesn't look for sites that give fair critique? He instead gets feedback from only the Superman Homepage and cons? That seems awful narrow minded. Does he read the reviews at CBR or Newsarama or Comic Vine? Can't he find places that do a good job of things? It just seems narrow-minded to limit himself like this. Especially when some of the questions asked in this very group ranged to 'horrible commentary, accusations, and rumor mongering'. Why not see what the right people think about books and take that into account? 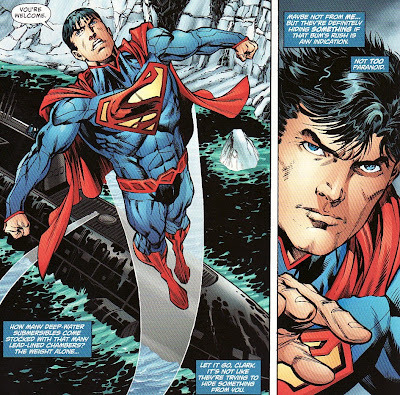 With Action Comics now being set in the present, can we except a shift in tone from the books? Also will Rags Morales stay on as the artist on the book? Will we get more guest artists like Gene Ha and Andy Kubert. Matt: Hey, Frank! Well, despite what we might have planned earlier, ACTION doesn't sync up with present-day continuity until issue #14, and even then, Clark's going to be a little busy with some timely matters. As for the artist end of things, we'll be doing something similar with issues #11-12 as we did with issue #8, with Rags and Rick being joined for a section of each issue by Brad Walker. #13 will be drawn by BLAHABLHA, and then Rags will return for issues #14-16. Beyond that, I choose not to reveal our plans, as they are most exciting, and I don't want to start focusing on them yet at the expense of what we have planned now and in the near future. I was interested in knowing when Action becomes a 'present day' book so it is good to learn that it will be in #14. I hope that issue #13 will be done by Gene Ha as I have loved his Superman stuff but I guess we'll have to wait and hear officially. Matt with Superman discovering recently that he's from Krypton and finding out about Kandor, etc... Will we see any stories focusing on Krypton, its history, Jor-El, Brainiac's involvement there and its final destruction? Matt: Oh, most definitely, Steve. Look for another cameo by Jor-El in issue #11 of ACTION, while the last days of Krypton (and a bunch of days from far earlier in its history) will be examined from a couple different perspectives in the surrounding Superbooks this fall. Bet your summer just got a lot longer, eh? So we learned that Supergirl #12 will have some origin information. Now we hear that Action #11 will have some Jor-El stuff. And then Krypton will be revisited in the fall in all the books ... hmmmmm .... maybe in the zero issues? 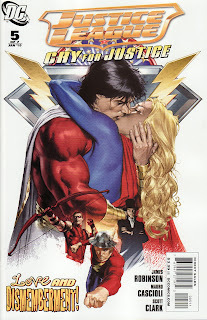 Or maybe in the hinted at Superman/Supergirl team-up coming up? 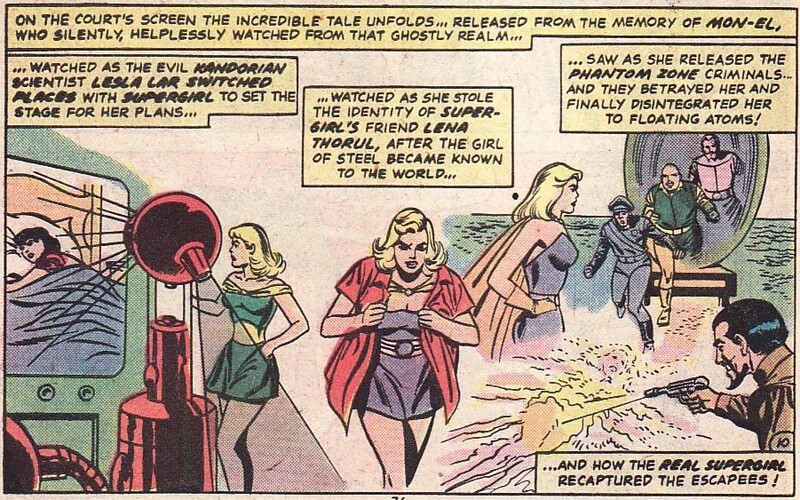 I do think that a year in would be a good time to reveal some of the bigger details of Kara's origins. It doesn't have to be everything, but enough to build the foundation of the character. Legion of Super-Heroes #9 came out this week and, I have to say, is probably my favorite issue of this DCnU run for the team. I have talked before about this book, about how the Legion feels tepid to me, not exciting and just sort of cruising along. I talked about how with Levitz juggling the massive cast of characters that I felt the momentum of the book was suffering. 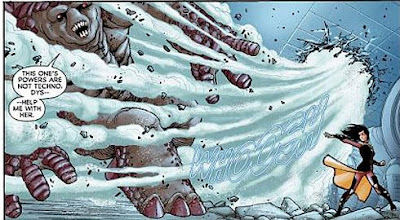 And I felt that the last 2 big story arcs - the Blue Flame entity and the Dominator invasion - were relatively lackluster. This issue seemed to tighten up all those concerns. And most of all, made me excited to read the next issue. It was as if the water of this book started to roil a bit and near a boil. Things are starting to come together in an ominous way. Suddenly I was that Anj of the 80s, devouring the Levitz/Giffen book and wondering when all the plots and characters would crash together. The wonderful cover by veteran Steve Lightle added to the effect. It's not a perfect issue. But it is very very good and that is what I am looking for in my Legion. Add to that Francis Portela' superior art. Portela has shined on this book throughout but here he seems to sparkle in both the quiet moments and action sequences. But, again, it is the meshing of multiple plotlines, the use of multiple characters, and the feeling of upcoming tension that brings it all together. The issue starts with Brainy still determined to break through the perceived Flashpoint wall and travel through time again. If they broke through the Time Trapper's wall, they can get through this. Joining him Harmonia Li and then Dream Girl who arrives because her powers sensed danger happening. Brainy barely registers they are in the room. Classic Brainy. But I love Dreamy here, talking about how her powers wouldn't detect Brainy's ineptitude and how she likes him despite his social foibles. I am calling it here ... a Brainy/Dreamy romance is going to happen. I think she protests too much. And it would harken back to Waid's short-lived run when they were romantically linked. The research is stopped when 2 mutated Dominators warp into the lab. One is named Dys and seems to have a technology dampening power. Suddenly computers, flight rings, and even force field belts are inoperable. I have always felt that Levitz has a soft spot for Dream Girl. He has never made her a simple glam girl although that is what she projects. He made her an effective leader, even during the time of the Great Darkness Saga. He had her sneakily being one of the smartest and mentally tough Legionnaires. Here, he shows that she did not shirk her combat training. Nice snap kick to the chops!! 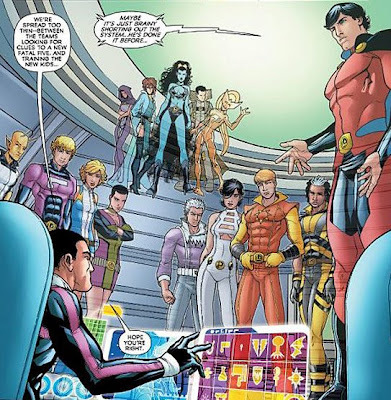 While the Dominators are scheming and skirmishing, Mon-El is investigating the re-creation of the Fatal Five. He heads to Takron Galtos where Validus is still trapped in his inertron cube. 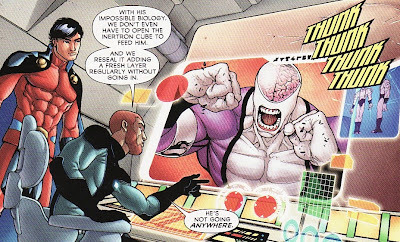 Is this the first Validus sighting of the DCnU or in Legion recently? Is this known to be Garth and Imra's boy? I forget where the old Legion ended and the cured 'Garridan Ranzz' began. Was that 5YL? Of course, I am starting to wonder if Shrinking Violet is unwittingly doing all this as the new Emerald Empress. She did absorb the energy in the last Annual. Is she living 2 lives, unaware? The Dominators continue to pound away in the Time Institute. Not only do they capture Brainy (who apparently was their target) but grab Dreamy as well. This reminded me a bit of The Universo Project from many many years ago when Dreamy and Brainy were part of a small group of Legionnaires who were so mentally strong they needed to be separated and imprisoned rather than controlled. The other dominator seems to be more of a hulking brute and is kept at bay by Harmonia Li and her abilities. I have to say I like the new look of Harmonia. She has a sort of Lady Shiva feel to her. And her superior air works well here. She seems like a goddess who is uninterested in sullying her hands in battle. I think this might be my favorite panel and there is no action happening. Cos is simply trying to keep track of all the Legionnaires and what they are doing. There are the away teams, each training or investigating. Who can he send when the attack on the Time Institute shows up on the monitors? 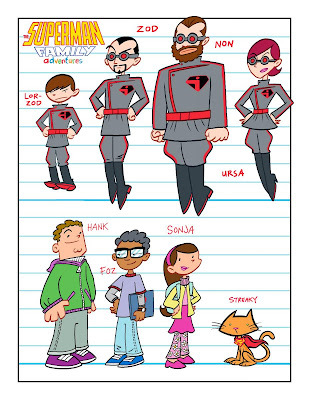 One thing I loved here was how much information Portela conveys about the characters here. Comet Queen is waving to the camera, Chemical Kid looking at her exasperated. Dragonwing is looking fierce and sideways, confident in a semi-'battle ready' pose. Vi has her arms folded looking perturbed. Nice. Who can help out? Ultra Boy of course. I do like how Levitz has him talk out the timing of his power switch going from speed to invulnerability to strength at just the right time. His punch incapacitates the Dominator thug to the point he is helpless. But the Dominator won't be taken in. He activates some inner suicide switch and unravels into a pile of glue. It is only after investigation that the goo is shown to probably be Dominator in origin. As I said, Levitz has there be more under Dreamy's sultry exterior. She is more than just a pretty face. Even this Dominator can detect her mental strength. And, even he can see that she acts like his companion. Why can't those two kids just admit they love each other?? The Legionnaires genes will be analyzed, their powers isolated, and then they will be added to the super-Dominator genome. Looks like an army of Legion-Amazos is going to crop up soon. With 2 Legionnaires kidnapped, Cos plans to bring the fight to them when suddenly Mon-El intercedes. The UP doesn't want to invade unless their is solid proof. Why risk war on an educated guess? Oh, I don't know ... how about 4 issues ago the Dominators brought their fleet through a wormhole into UP space. Isn't that enough reason?? Didn't the Dominators break the treaty?? This seemed like a lame reason to not go after your friends, especially given recent events. Anyways, isn't this just what an Espionage Squad made for? If Cos doesn't form a covert team ... or look the other way when other leave on their own ... I'll be upset. At least Star Boy is upset. If a Legionnaire can't rescue Nura then he isn't a Legionnaire. He quits. That sounds like what Thom would do. Too bad Dreamy is going to dump him. At least, that's my guess. Anyways, this issue got the Legion book simmering for the first time in a while. There are a lot of threats on the horizon and the Legion are grasping at straws a bit. It has been a while since I was excited to get the next issue in my hand. That's a good sign. And I have to compliment Portela again. Man, this is a gorgeous book to look at. Scott Lobdell On Superman ?